Nirvana Hermitage is located on a hill in Anjuna, Goa. Surrounded by tropical gardens, it features an outdoor pool and an international restaurant. Yoga classes and a meditation room are also available. Air-conditioned rooms come with a private balcony and a flat-screen satellite TV. They have private bathroom facilities featuring a bathtub. A hairdryer, tea/coffee maker and a minibar are provided. Wi-Fi is available at an additional cost. Nirvana Hermitage is 46 km from the International Airport and 20 km from Panaji Capital. Free parking is available. Hermitage Nirvana Hotel features pampering spa treatments, and a quiet library. Car rentals and day trips can be arranged at the tour desk. Guests can make use of the pool-side barbecue facilities, or enjoy drinks at the sunken pool bar. Wireless Internet Hotspot is available in public areas and costs INR 91 per hour. Free! One child under 5 years stays free of charge when using existing beds. One child under 2 years is charged INR 1360 per night in a child's cot/crib. 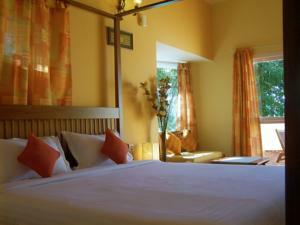 One older child or adult is charged INR 5892 per night and person in an extra bed. Maximum capacity of extra beds/children's cots in a room is 1. Any type of extra bed or child's cot/crib is upon request and needs to be confirmed by the hotel. Supplements will not be calculated automatically in the total costs and have to be paid separately in the hotel. Visa, Euro/Mastercard, Diners Club, Discover The hotel reserves the right to pre-authorise credit cards prior to arrival.